...YOU be the Immigration Judge. So, what do you think? Should the judge give him a Green Card or order him deported? Judge Robert P. Owens ordered that Rosales’ application for adjustment of status to lawful permanent resident be granted. Translation: He was given a Green Card. One is left wondering who would be considered deportable. Well, the judge surely blew this one. The judge ruled in April of this year. 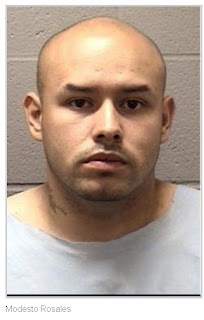 On June 23rd Rosales and another man invaded the home of his former girlfriend (and mother of the five-year-old), beat her, beat the man in the home with an iron…all this while his son watched on (so much for the “good father” part). ELGIN — One of the men accused in last weekend’s home invasion and brutal beating of two people was allowed to stay in the country by a judge in April, federal documents indicate. According to U.S. Department of Justice Executive Office for Immigration Review Immigration Court documents obtained by The Courier-News and dated April 12, 2012, Judge Robert P. Owens ruled in favor of Modesto Rosales during removal proceedings against Rosales. Owens ordered that Rosales’ application for adjustment of status to lawful permanent resident be granted. According to reports, Rosales, 23, and Jaime Zarate, age unknown, are accused of invading a home along the 400 block of Raymond Street early Saturday morning, where they beat a man in the face with an iron and also beat Rosales’ former girlfriend in front of her 5-year-old child. Elgin police arrested the two men later that morning after a short chase near Rosales’ home in the 300 block of Wilcox Avenue, reports stated. Reports stated both had been out on parole and were charged with home invasion, a Class X felony, and four counts of aggravated battery, a Class 3 felony. Rosales also was charged with aggravated domestic battery, a Class 2 felony. The men remain in Kane County jail Wednesday with bail set at $500,000 for each, and both are to appear in court again Friday. The adverse factors Owens considered were that Rosales “has been convicted of driving under the influence, driving on a suspended license, possession/consumption of alcohol by a minor, domestic battery/bodily harm, and unlawful possession of a firearm,” the document states, noting these offenses took place between July 24, 2003, and March 18, 2009. Rosales also testified that he had been arrested on several occasions as a juvenile on charges including residential burglary, disorderly conduct, aggravated battery and resisting an officer, the document states. Favorable factors considered by Owens included that Rosales has been in the United States since he was 2 years old, had never left the U.S., and that he is more comfortable speaking English than Spanish. The document also notes Rosales’ strong family ties in the U.S. and a citizen wife, “although she testified that she plans to divorce him when she has the time and money to do so,” the document states. In October 2011, he enrolled in “Transforming Incarcerated Dads” to improve his parenting skills, the document states, and Rosales also enrolled in several classes to increase his job skills while last incarcerated. An immigration hearing was conducted March 12, the document states. On Aug. 5. 2009, the Department of Homeland Security served Rosales with a notice to appear in court for remaining well beyond well beyond the six months allowed as a B2 visitor who came to the United States through Brownsville, Texas. On Jan. 19, the DHS served additional charges regarding Rosales’ Dec. 28, 2010, conviction for unlawful possession of a firearm, a deportable offense.